Our next pre-apprenticeship course will be starting Wednesday April 26th at Holden Hill. If you are looking for an apprenticeship in South Australia, this is the course to give yourself the best chance possible. FCTA – Building Careers also trains apprentices, so students in the Certificate II in Construction (CPC20112) have the opportunity to work next to apprentices and find out about tradie life. We have strong links to the industry and are in direct contact with builders who currently, or previously have had apprentices. Often they will come to us directly for a recommendation on who to hire. While industry work experience isn’t mandatory for the Certificate II in Construction, we strongly encourage it and assist students to find places. This has been the way many of our students have secured apprenticeships. 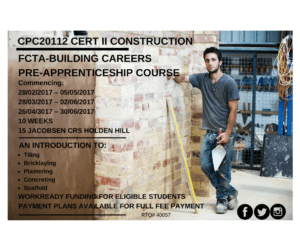 Pre-Apprenticeship Course – New Dates Offered! 8am – 3:30pm Tuesday – Friday for 10 weeks at 15 Jacobsen Crs, Holden Hill. WorkReady funding is available for eligible students. This course is designed to assist students to become ready to work as apprentices. Employers have contacted us seeking apprentices that are reliable, able to follow instructions and have their drivers licenses. Call us on 8367 5617 or email admin@fcta.com.au to book in a time to discuss the course. Pre-apprenticeship students are more likely to secure an apprenticeship, and keep it. We have a wide range of people complete these courses, and great examples of former students who have secured apprenticeships. Changes to Skills for All funding from 4/11/2013 mean students need to meet a narrower criteria to receive fully funded training in Certificate II level courses, commonly referred to as ‘Pre-Apprenticeship’ courses.